While lots of edibles offer uneven dosages and bulk-quantity candy taste, Lord Jones takes a drastically different approach, creating a high-end edible experience that caters to low-dose consumers expecting quality and consistency. 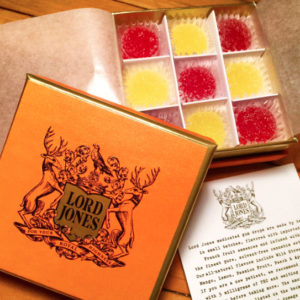 Lord Jones gumdrops have been singled out by High Times and Vice as one of the best and most elegant low-dose products on the market. Lord Jones uses only five ingredients, giving it a very natural yummy taste. I don’t know how they do it using only these simple ingredients, but they’ve entirely masked the cannabis taste, which is very rare in cannabis-infused gummy products. I literally love these gumdrops. Have you ever gone to Sugarfina store? Sugarfina calls its store the ultimate candy store for grown-ups and that’s exactly how I feel about these Lord Jones candies. Given the price point at $3 a candy (almost $30 a box), it’s not something I would go to every day but this does have a very high-end feel and taste and it’s perfect for gift giving if you live in California. What I like most about these candies is the high ratio of CBD to THC. They market it as 5:1 but what’s more important to me is the total dose. 10mg of CBD to 2mg of THC creates a very mellow experience, on par in my opinion with a Xanax, but without all the disruptive side effects. Lord Jones offers several other low-dose products, including a 20mg CBD line and a 5mg THC line as well, making it a brand to watch as recreational cannabis spreads its wings this year in California.